Vishay Intertechnology, Inc. today expanded its offering of surface-mount TMBS® Trench MOS Barrier Schottky rectifiers with 15 new 1 A, 2 A, and 3 A devices in the eSMP® series low profile SMF (DO-219AB) package. 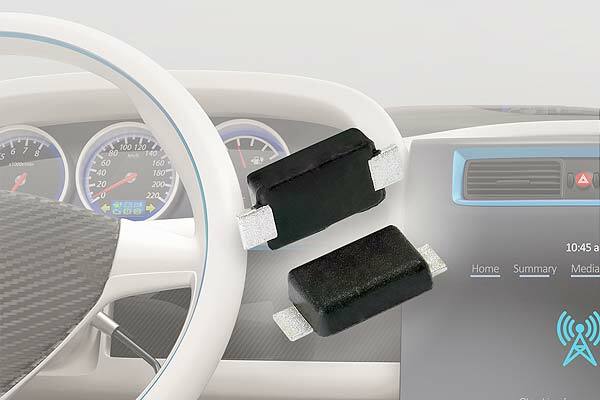 Providing space-saving alternatives to Schottky rectifiers in the SMA, these Vishay General Semiconductor devices feature reverse voltages from 45 V to 150 V, while their 3 A rating is the industry’s highest for the SMF package. Currently, Schottky rectifiers with current ratings to 3 A are typically available in the SMA package. The devices released today increase power density by offering this high forward current in the smaller SMF. Measuring 3.7 mm by 1.8 mm with a low 0.98 mm profile, the package is 46 % thinner than the SMA and occupies 49 % less board space. With their forward voltage drop down to 0.36 V for 1 A, 0.40 V for 2 A, and 0.43 V for 3 A devices, the rectifiers reduce power loss and improve efficiency in high frequency inverters, DC/DC converters, and freewheeling and polarity protection diodes for commercial and industrial applications. The devices are also available in AEC-Q101 qualified versions for automotive applications. The new rectifiers feature a maximum operating junction temperature up to +175 °C and an MSL moisture sensitivity level of 1, per J-STD-020, LF maximum peak of +260 °C. Ideal for automated placement, the devices are RoHS-compliant and halogen-free. Samples and production quantities of the new TMBS rectifiers are available now, with lead times of 12 weeks for larger orders. More information on the part numbers listed in the above table is available at www.vishay.com/doc?48477.